Which title field do I use? You may have noticed that there are three different 'Title' fields, one on the 'Manage Content' screen, and two on the 'Define' screen. They all have very different purposes. 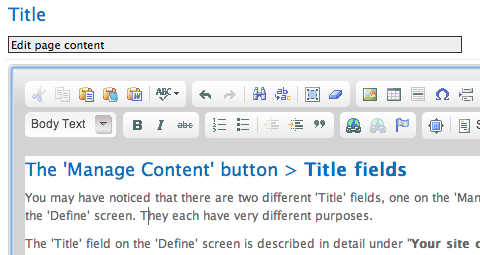 The 'Title' field on the 'Define' screen is described in detail under "Your site content > Adding new pages > Title". To summarize, it says that the "Title' field found there is for purposes of initially establishing the URL for the page, and setting the title in your site "tree" in the Content manage window. If you go to that Title field page in your browser, you can see that the text at the top of the browser window matches that line in the search engine results exactly. This has happened because we entered "Using the Title field" into the SEO Title on that page's 'Define' screen. As shown, the company name is automatically entered on the right of that title in our BytePages CMS sites. You do not need to enter that in the SEO title field. The 'Title' field found at the top of the 'Manage Content' screens, as shown here, is solely for the purpose of putting a large header at the top of the content of the page it describes.